At 9:15 this morning, London’s Metropolitan Police entered the Ecuador embassy where they arrested, handcuffed and forcibly removed WikiLeaks’ founder Julian Assange at the invitation of Ecuador’s president, Lenin Moreno. Police transported Assange to a London court where District judge Michael Snow called Assange a “narcissist” and ridiculed concerns about getting a fair trial before declaring him guilty of violating bail, and ordering him held for sentencing. 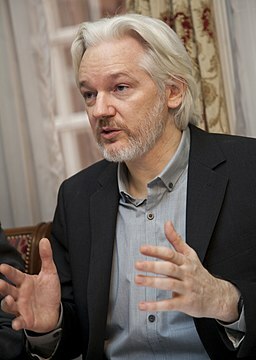 Assange took refuge at the embassy seven years ago. Rafael Correa, the previous president of Ecuador, granted him asylum and citizenship based on fears that US authorities planned to extradite him for publishing disclosures of US government wrongdoing by whistleblower Chelsea Manning. Representatives of the UK and US governments gaslighted such fears but today’s events proved the fears well-founded. Chelsea Manning is currently imprisoned in the US for refusing to participate as a witness at a grand jury proceeding alleged to be investigating Julian Assange. In an interview with RT, Correa said revoking Assange’s asylum violated Ecuador’s constitution and discussed Moreno’s possible motives. “Paul Manafort, the head of the Trump presidential campaign, visited Ecuador on May 30, 2017, weeks after Moreno took the office of the president. And even then Moreno offered to hand out Assange in exchange for financial enrichment from the US,” Correa said. For now, we can only wonder what US president Donald Trump gets out of the deal as he absurdly claims to “know nothing” about WikiLeaks after openly praising it and challenging it to find Hillary Clinton’s missing emails. Controversy has swirled around WikiLeaks since it published emails embarrassing to Hillary Clinton and the Democratic National Committee during the 2016 presidential campaign. The Centre for Investigative Journalism (UK) released the following statement.